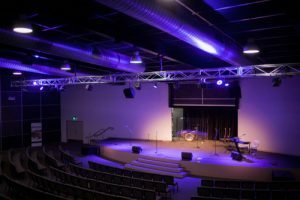 Canberra’s C3 Watson is typical of a modern contemporary Christian church. It has a high standard of musicianship, and a genuine desire for strong production values. Having previously been meeting in a school gymnasium and experiencing all of the limitations that entails – such as weekly setup and pull down, poor acoustics and lots of ambient light – the C3 Watson team was very much ready to flex its creative muscles in a custom built and designed environment. The church venue is an entirely new build on a green field site. As the church is in a residential area, stringent restrictions were placed on the building by the local council to meet its noise pollution guidelines. As such, the building is predominantly constructed of concrete tilt slab and features very significant acoustic treatment and modelling to ensure that the noise is kept inside. The concept for the system was established with assistance from Mr Oliver at Streamstone and Mr Watson at PAVT. ‘The new system needed be able to take them to the next level and give their team significant scope to grow,’ says Mr Oliver. 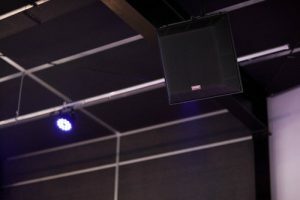 ‘The PA needed to sound “big” and have plenty of headroom to effortlessly produce the high dynamic range of modern worship. It also needed to have excellent speech reproduction. Lighting needed to be cost effective but retain plenty of creative scope and room for growth and video had a similar brief. With the concept set out, Streamstone, working with the church set about selecting the appropriate equipment that would meet the needs of C3 Watson. ‘On the audio side we worked closely with Dave Watson and the team at PAVT. The lighting and vision was primarily put together by myself with some assistance and training provided to the church by Jonathan Ciddor from LSC Lighting Systems,’ explains the Streamstone director. ‘The church took an active role. I met with C3’s team a number of times through the lead up to discuss their needs and desires. I then put together a range of options and solutions and worked with them extensively to marry the needs, equipment chosen and the budget together to a final solution. ‘All of the equipment was carefully chosen in keeping with the requirements,’ notes Mr Oliver. ‘The speaker system was a significant part of the outlay, with EAW QX596i point source top boxes and SB2001 subwoofers all powered by Powersoft K series amplifiers. Budget was an issue throughout the whole project and needed to be carefully managed. The other major component of the audio system is the mic package. For this, Streamstone opted for a combination of Sennheiser and Countryman. Three channels of wireless Sennheiser Evolution 100 series G3 wireless with two handhelds, and a wireless belt pack with a Countryman H6 low profile headworn mic have all been put to use. Alongside this, Streamstone also supplied some Audix drum mics. Despite seeing room for expansion, Mr Oliver is clearly very happy with what has been achieved at C3 Watson. ‘I’m very pleased with it overall, the sound system is particularly impressive, and the lighting and vision looks fantastic,’ he enthuses. ‘It was a great journey to go through with the church’s team – one of my favourite things about what I do is building relationships with people as we work through projects like this. It’s so encouraging for me to work with people as they come to the realisation of a dream they’ve had for sometimes years. I get a lot of enjoyment out of seeing the C3 team’s excitement as we fire up their new equipment for the first time and grow into it – it’s why I do what I do! ‘The whole facility is an enormous blessing to the church and their community,’ continues Mr Oliver. ‘In so many ways it has taken them so far beyond where they previously were and is really lifting the profile of the church in the community. The production values are of a very high standard and as good as or better than you’ll find in any top end commercial facility.